Vacation has started, and time for the real analysis. 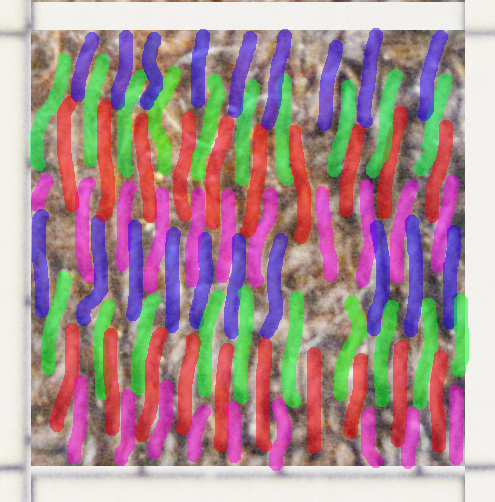 I started with analysing the ground weave. To be able to reconstruct the weave I need to know the weave type, which is warp and which is weft, the densities, types of thread, types of wool, thread thicknesses, spinning directions and twist angles (how much twist there is in the thread) of both warp and weft. Let’s start with the weave type and which is warp and which is weft. Selvedges are often a help, but in this case there are no edges left on the fragment, so I needed to look at the weave itself. One of the thread systems is increadibly dense, making the other almost invisible. 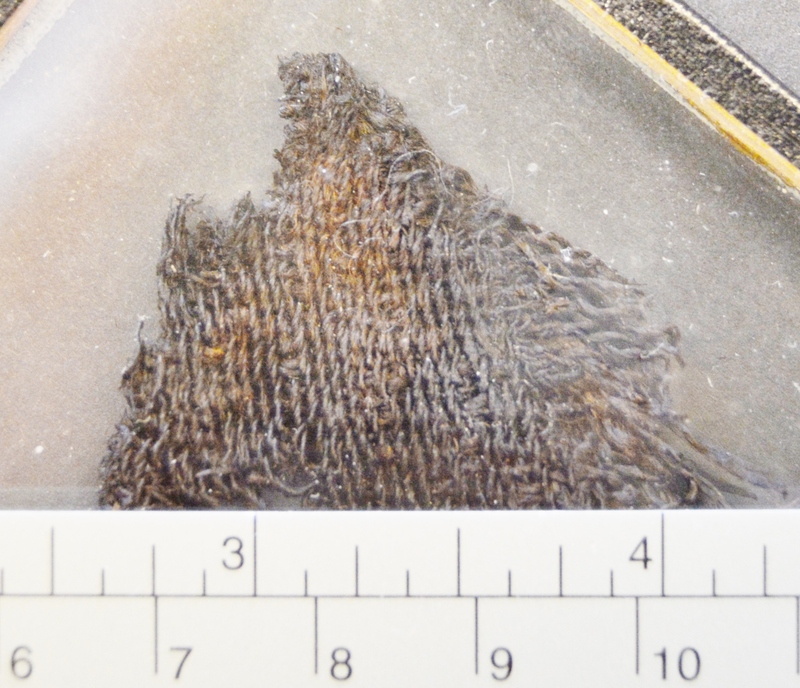 In late iron age textiles the warp is often much denser than the weft, but is this the case here? There are two things to go on here; one is the threads. In the dense system the threads are z-spun with a twist angle of 20-35 degrees, and in the other system they are s-spun with an angle of 15-25 degrees (z- or s-spun means that the diagonal lines in the thread correspond to the diagonal lines in the letter z or s). 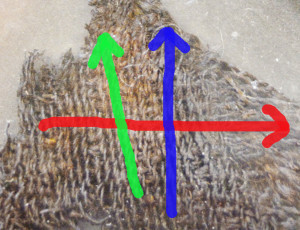 The warp typically has a higher twist angle than the weft, but the difference is not large here. Iron age textiles sometimes have a z-spun warp and s-spun weft while the opposite is essentially unknown, but this might be an exception so I have no proof there either. Now, I haven’t actually started analysing the pile, but I need to take a brief look at it anyhow to solve this problem. In a piled weave the ground weft is woven in the ordinary way, then the pile is knotted in one way or another around one or more warp threads. It is very hard to knot a pile around the weft and much easier to knot it around the warp which is still partly free during the weaving. In this weave the pile “knots” are found around threads in the dense system, and parallel to the almost invisible thread system. 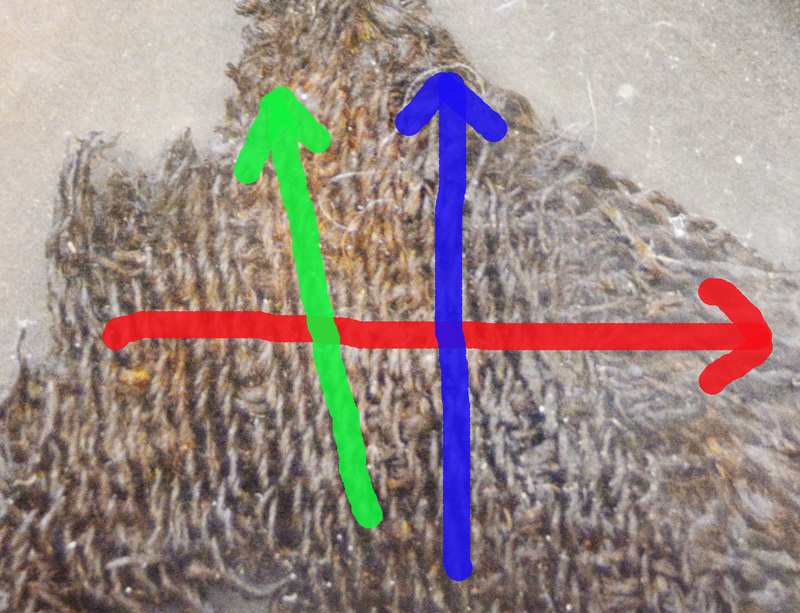 This means that the dense thread system most probably is the warp and since that fits with the spinning directions and twist angles too, I will assume that this is correct and use that as the base for the rest of the analysis. 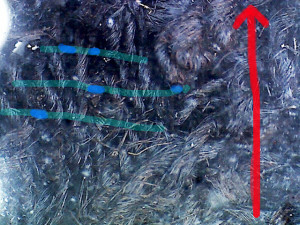 To the left, the red arrow indicates the weft direction, the blue arrow is the warp direction and the green arrow shows the steep diagonal lines that are clearly visible. The weave is a diagonal twill, which is indicated by both these lines and the fact that the warp threads can be seen passing over two wefts before they disappear in the weave again. The remaining question is if it is a 2/2 twill or a 2/1 twill. You typically see this by following the threads, but in this case the warp is so dense that it is practically impossible to see where a thread appears again. So I looked at the right side of the weave instead. On the wrong side it was obvious that the warp passed OVER 2 threads, but not possible to see how many threads it passed UNDER. For a 2/2 twill each warp thread should pass both OVER and UNDER 2 threads (as in the picture to the right), but on a 2/1 twill it should pass OVER 2 threads and UNDER 1 thread on one side and the opposite on the other side. This means that it should only pass OVER 1 thread on the right side, while a 2/2 twill should look the same on both sides. Here is a picture taken with the microscope, from the right side of the fabric. You can see both the pig tails of the pile to the right, and a corner of the ground weave to the left. It is even harder to distinguish the weave here, than on the wrong side, but I have the information I need as you will soon see. To the right I have marked with blue where the weft threads are visible. 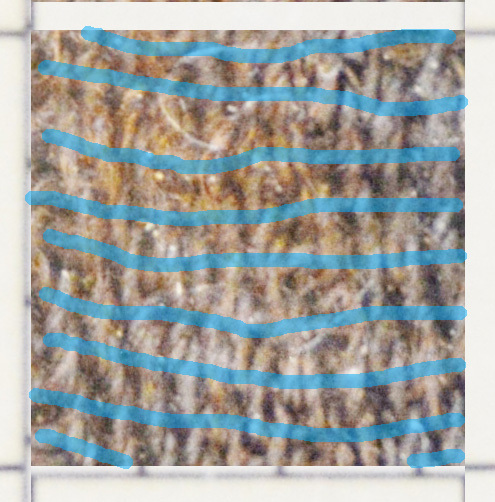 And here, to the left, I have used that, and the structure, to fill in where the wefts are hidden and marked them with blue-green. When I now, to the right, mark the visible parts of the most distinguishable warp threads with purple, it becomes clear that they pass OVER 2 wefts on the right side too. 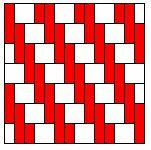 This means that the weave type should be a 2/2 twill. The next step is to count the threads to get the densities. 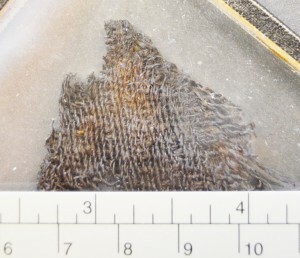 The fragments are put between two sheets of glass, which made it impossible to take good photos with the magnifying glass (the magnifying glass has a small integrated ruler which normally makes it perfect for counting threads). Therefore I had to use a picture taken with an ordinary camera, but with a ruler placed on top of the glass, to be able to count threads. I simply took this photo (the one at the top of this page), copied and moved around parts of the ruler in Photoshop Elements to get an area of 1x1cm where it was possible to clearly see where the wefts and warps were. I started with counting the weft threads, because it was easiest, and because it simplified the work with the warp later. Even if the weft itself is hidden beneath the warp almost everywhere, the structure of the weave makes it easy to see where it is. In the picture to the right I can see 8 wefts per centimeter. When looking at the warp I have used the fact that I assume that it is a 2/2 diagonal twill. In the picture to the left I have marked the warp threads with four colours based on that assumption, since 2/2 twill has four shafts. You can count to 10-11 reports of 4 threads per cm, which gives a density of 42 threads/cm. As you may see, it is not possible to see which threads are the same when they disappear in the weave and then appear again. A few of the threads are not marked because they are not clearly distinguishable on the photo. I have also measured both thickness and twist angles in several places on the weave, and compared the threads to some standard yarns that I brought with me. For the thickness I used a ruler on the picture with the ruler at the bottom, and for the spinning angles I used a very useful card I got by Marie Ekstedt Bjersing (my teacher at the course at Sätergläntan which this analysis is a part of). It is hard to measure the twist angle on a single yarn, and it varies, so I have given an interval. Both warp and weft are about as thick as a 20/1 thread. The difference between the warp and the weft densities is extremely high, which makes me still slightly unsure about that part of the analysis, but except for that it is a typical late Iron age twill. It will be an interesting challenge to weave this fabric, and the test weave will probably give interesting new insights. Next post will be about analysing the pile.